The Golden Rule was spoken by Jesus and is found in the Bible in the New Testament in Matthew 7:12 and Luke 6:31. It is commonly quoted as "Do unto others as you would have them do unto you." The exact quotation by Jesus found in the passages of scripture is slightly different depending on the Bible version. The context of the the Golden Rule is Jesus giving the Sermon on the Mount to His disciples. The second Bible passage with the Golden Rule is different. While this passage is similar to the Sermon on the Mount some Bible commentators view it as a different sermon. Luke 6:27-38 But I say unto you which hear, Love your enemies, do good to them which hate you, Bless them that curse you, and pray for them which despitefully use you. And unto him that smiteth thee on the one cheek offer also the other; and him that taketh away thy cloak forbid not to take thy coat also. 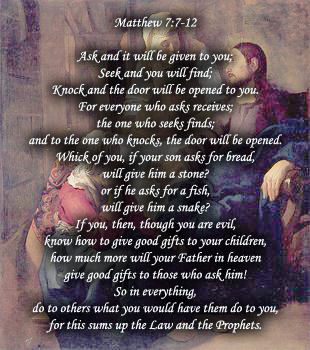 Give to every man that asketh of thee; and of him that taketh away thy goods ask them not again. And as ye would that men should do to you, do ye also to them likewise. For if ye love them which love you, what thank have ye? for sinners also love those that love them. And if ye do good to them which do good to you, what thank have ye? for sinners also do even the same. And if ye lend to them of whom ye hope to receive, what thank have ye? for sinners also lend to sinners, to receive as much again. But love ye your enemies, and do good, and lend, hoping for nothing again; and your reward shall be great, and ye shall be the children of the Highest: for he is kind unto the unthankful and to the evil. Be ye therefore merciful, as your Father also is merciful. Judge not, and ye shall not be judged: condemn not, and ye shall not be condemned: forgive, and ye shall be forgiven: Give, and it shall be given unto you; good measure, pressed down, and shaken together, and running over, shall men give into your bosom. For with the same measure that ye mete withal it shall be measured to you again. A common joke on the Golden Rule is "He who has the gold, rules." That version of the golden rule is obviously not found in any passage of the Bible. The Golden Rule in the New Testament Bible bring you these weekly Bible verses.